Hurray! Thanks for swinging by le blog to link-up for some networking! Every single week there are some incredible bloggers that you are bound to discover. Your on your way to new great reads and more loyal readers! I have had so much fun lately sharing our new lifestyle change with you all, from our eating plan to our grocery list, and now I am here to share some fitness fun. Growing up, I was always active with dance and sports and loved every minute. I was with my friends and having fun, which totally distracted me from the struggles of training. Once I went away to college and was without team sports and dance class, I had to learn how to workout on my own. Within the first year, I slowly learned to enjoy running to relieve stress, and started going to the gym at 6AM before class. Now, 8 years later, I am so glad that I actually find pleasure in attending a workout class or taking the Beast on a walk. 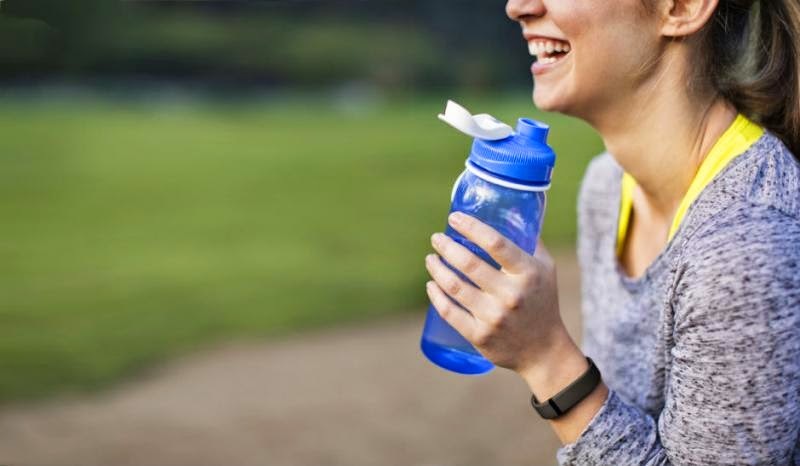 I just purchased my Fitbit Flex and I already love it. As I move throughout my day it tracks my steps, calories burned, activity level, water intake, and calorie intake. Meanwhile at night it tracks my sleeping patterns, which is totally nerdy for me to be so excited about, but it's very interesting to see if I had a restful night sleep or if I was rolling around like a tornado! Believe it or not, it tracks all of this while wearing a stylish colorful bracelet (I chose yellow... are you shocked? ), and syncs wirelessly to your smart phone, tablet, or PC. I also love that you can pop out the tracker at any time and switch it to another colored bracelet. 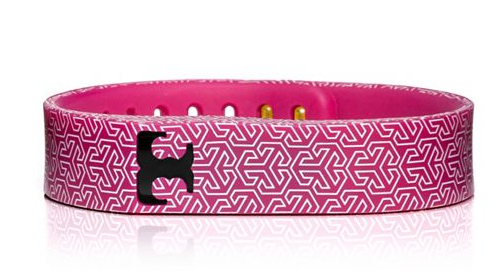 I am loving the soon-to-be-released Tory Burch band designs - both athletic styles and gold jewelry styles, that are way more trendy for all you fashion forward gals! I got my FT4 Polar 6 months before my wedding as a workout motivator, and have been wearing it ever since. 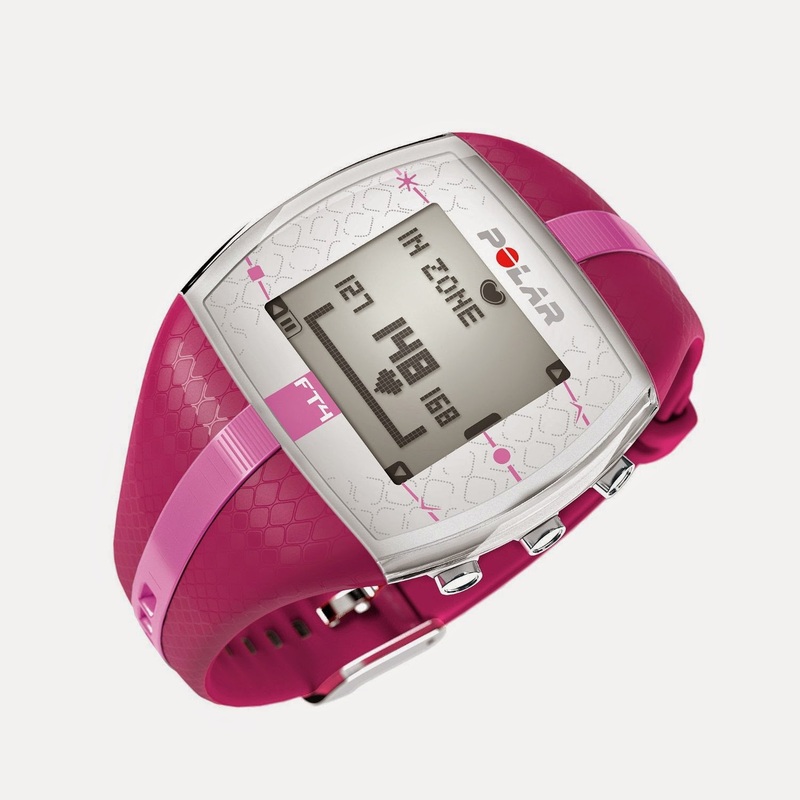 If you don't have this and you need a fitness wake-up call like I did, you need to rush to Amazon and buy this watch ASAP. If you've been going to the gym and tracking your calories burned by what's on the treadmill, think again! 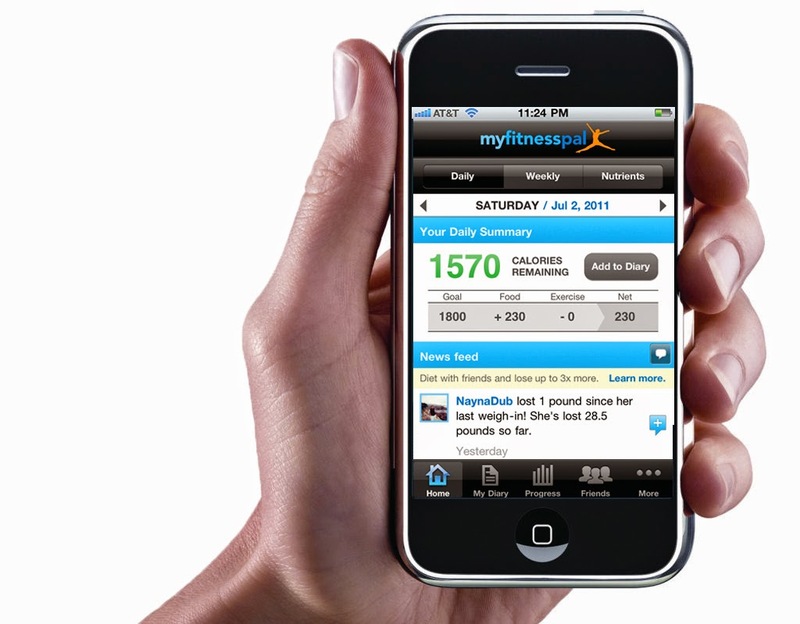 Mine was off by over 200 calories, but this tracks your specific calorie burn accurately. 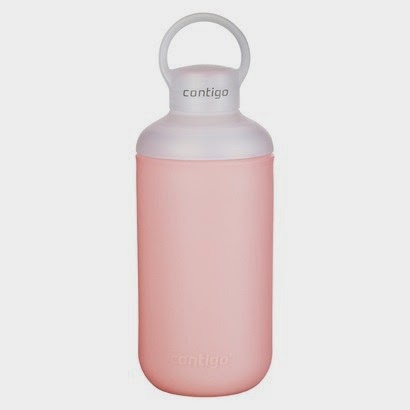 I absolutely love these autoseal Contigo bottles. The big one I use for my water all day everyday, and the Tranquil bottle I use with a blender ball to blend my protein powder for breakfast or post-workouts. You can shake those things silly and they will never ever leak. 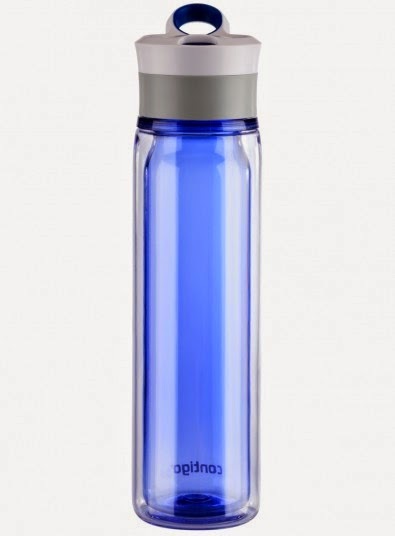 Way better than past Nalgene or Camelbak bottles. Always cute styles of tanks and tees, and I have 3 pairs of their workout leggings and capris. They are made well, despite their affordable Target price, and they've lasted me for years. 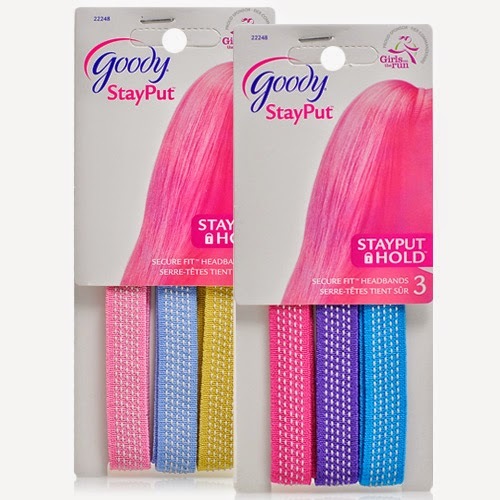 Having very fine, thin hair and cheekbone length bangs, I depend on these grippy little headbands to keep loose strands out of my face. With other headbands, they tend to slide out of my hair mid-workout class, but these headbands have thin little sticky strips all the way around the band to keep it from budging. Not to mention, they are cheap and easy to find at most drugstores. 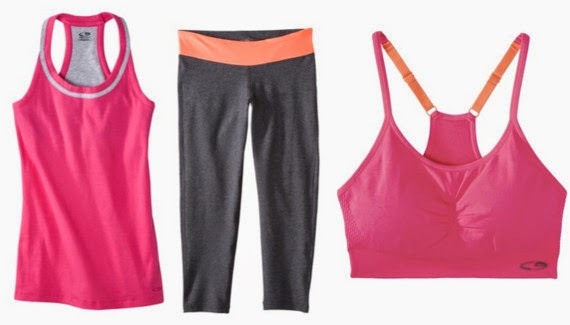 Have you seen the Old Navy Active line? I am a girl who loves color and texture, and ON is doing it right. Every season they introduce new patterns and colors of their most popular tanks and tees, and they're always on sale. I mean, who can beat a $9 dry fit, super cute workout top? They also have great workout jackets, well fitting sports bras, and sometimes hair accessories. This is also a newer obsession for me. This winter I had a GAP gift card, so I went browsing through the GapFit section until I came across their leggings. Holy heck. I like them so much I bought long ones for cold weather workouts, and little capri leggings that I sport at yoga and Zumba. They are high waisted, have a drawstring and thee structure of the material hides any lumps and bumps. I know you have probably heard about this time and time again from me, but I love this free app. What a great way to get in the habit of keeping a food and exercise journal, and it syncs effortlessly with my Fitbit for a streamlined, simplified lifestyle tool. Feel free to add me on MFP and we can do this healthy living journey together. Encouragement is key! What are some of your fitness must haves? So glad you dropped by for a little link-up networking! Grab a latte and get comfortable... you are bound to meet some great bloggers. I hope all of you had a wonderfully relaxing weekend. We had lots of fun outings and celebrations with family and friends, so it was a memorable weekend for sure. Lots to be thankful for. Have a wild week, y'all! It's been a solid 12 days of sticking to our simple, healthier eating plan, and my energy is out the roof! I am down 5+ lbs. and Adam has rocked it out at 7+ lbs. lost. 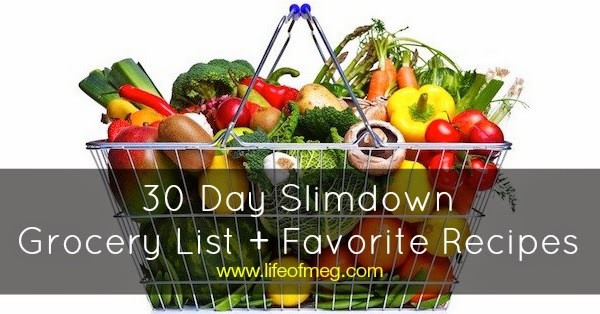 After posting our 30 Day Slimdown Challenge eating plan last week, I've received messages from many of you asking about what type of foods we purchase at the grocery store in order to set ourselves up for success. So since you asked nicely with extra sugar on top, I am here to deliver the inside scoop! 3) No caffeine, sugar, white flour, fried foods, etc. 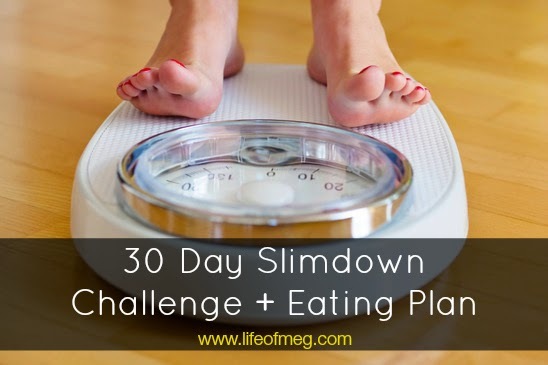 For more insider information to our 30 Day Slimdown Challenge eating plan, check out this post! To see my food and exercise journal, add me on MyFitnessPal! 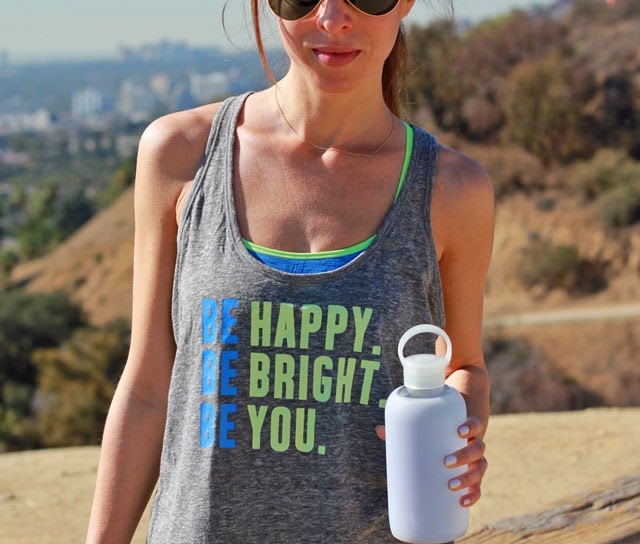 Here's to a healthier + happier you! Anyone else on their 3rd round of caffeine? It's definitely a Monday, and I'm trying to get myself in work week mode. Please tell me I'm not the only one dragging! Although it was our Slimdown Challenge weigh-in day, and I've lost 4.2 lbs! Woop woop! Now that's a heck of a great way to start off a Monday morning. Inching closer to healthy everyday and you can join me on the journey via MyFitnessPal! I just wanted to say I'm glad you're here, I'm glad you're you, and thanks for taking the time to stop by to make Mondays happier! 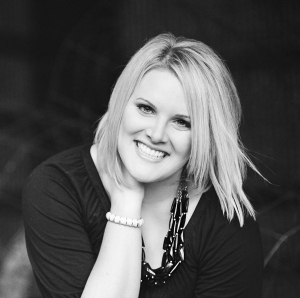 I hope you meet some great new blog friends and find a few extra readers! Have a spectacular start of the week, sassy ladies (and guys?)! Elle Magazine recently had the opportunity to sit down with Grammy Award-winning artist, Colbie Caillat, and talk about her brave, new life mantra. Her newly released EP, Gypsy Heart, boasts a "powerful new music video in which she makes a powerful statement about unfair beauty ideals by shunning hair and make-up." She opened up to the fashion magazine about why she is tired of being Photoshopped, has shut down people's expectations for women, and has never felt better. "When I see gorgeous models and singers and they look perfect on their album covers, it makes me want to look like that, too, and it makes me feel like if I don’t Photoshop my skin on my album cover, I’m the one who’s going to look a little off and everyone else is going to look perfect. And that’s what everyone is used to seeing." You can see just how freeing it is for her to wipe off her make-up, unclip her hair extensions, and simply feel beautiful being in her own skin. What an amazing message for women everywhere to be vulnerable and real. "We shot the video in reverse, we started bare, and by the end we finished with the full hair and makeup, and then reversed the film for the finished product. All of the women were amazing. My favorite was the woman who has no hair. I first saw her completely bald, no makeup, with a huge smile, she was just so happy and confident. She was so beautiful to me." Wow. How brave and refreshing. 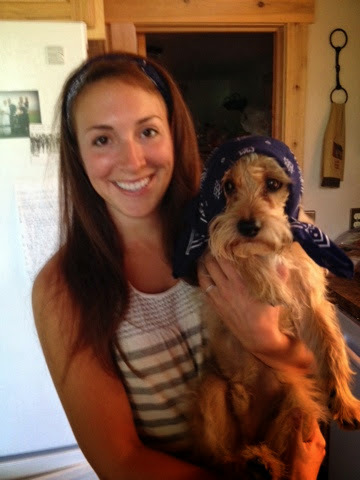 Bravo, Colbie! Help spread the word to women everywhere. I don’t know about you all, but I celebrated the 4th of July holiday with a little too much indulgent food, three margaritas too many, and a belly ache. 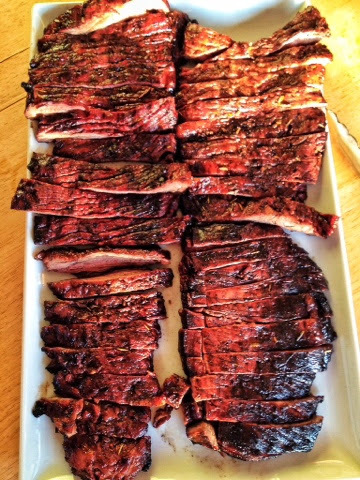 It’s so easy to do overindulge when the weekends are filled with summer BBQs, dinner parties, happy hours, and the like. And that has tended to be the norm ever since a few months past our honeymoon. It felt so good to let loose after our wedding that I never really honed it in on a consistent basis. 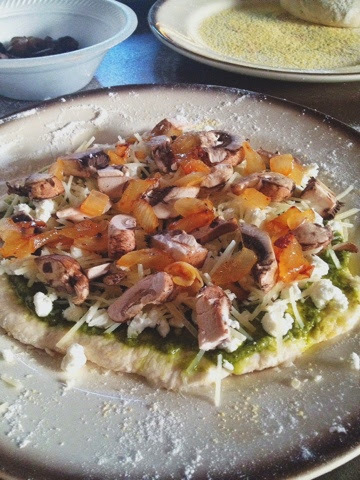 I loved moving in with Adam after the wedding where I enjoyed cooking delicious meals, inviting friends over, baking up a storm, and rushing home after work every night to spend time with him. So all that hard work of a nightly gym regimen, eating copious salads with grilled chicken, and feeling good in my body flew right out the window. Thank goodness Adam and I were on the same page when we both discussed a little lifestyle change boot camp was majorly needed. With a Christmas trip to Hawaii planned (more details to come soon!) and my high school reunion approaching this next year, what better motivation than to start our journey together now. We have been talking about how we want to approach this plan for a few weeks, and found something that is working out great for us so far! We are kicking it off with a 30 day challenge of following the plan with no cheating to jump start the road to healthy. Here are the deets below to in case you are looking for good way to spark your healthy eating motivation. I will be sharing our grocery shopping list + favorite recipes next week! We both took body measurements at the start of the week so that we can compare our success with where we started. Sure, it will be great to see the number on the scale go down as my body adjusts to the new lifestyle, but losing inches and building muscle is more important to focus on. And we got brave by taking before photos - what an eye opener!. Looking forward to feeling like myself again, and so glad I have a partner in crime along the way. What helps you keep a healthy lifestyle? Any great tips you try to stick to? I spent the whole weekend outside as much as possible, and I was in my element. We slept in, made homemade meals, did a lot of cheersing with adult beverages, and held the annual family olympics tradition (go Team Orange!) - which included a triple challenge in bocce ball, soccer, and kayak races. A little sunshine and exercise was exactly what I needed, and we had such a great time that I almost didn't come home. Thankfully I am rounding up some girlfriends for a ladies cabin weekend in a few weeks, otherwise cabin fever might set in (Pun intended? Unintended? I clearly have decision making issues...). So anyway, here's a sneak peek at all the fun and adventures. The typical cabin get-up. 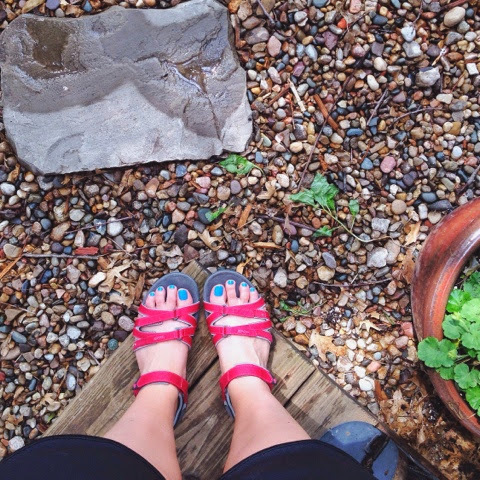 My favorite hiking sandals, comfy shorts, sunscreen, and sunnies. 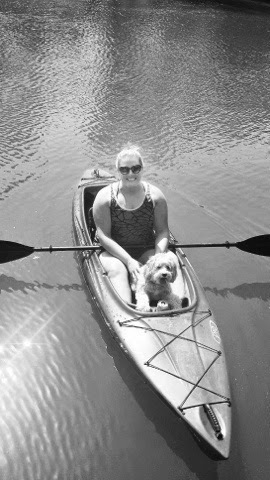 Had to be ready for some leisurely kayaking, a pick-up soccer game, or to grab a super soaker (and run!) at the drop of a hat. 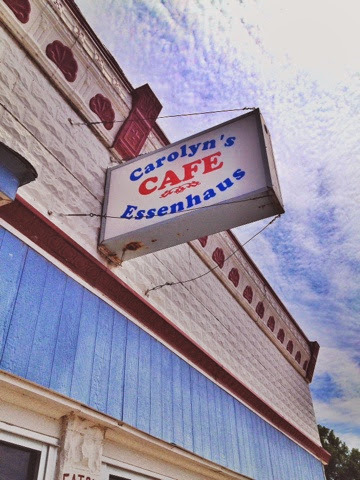 Of course we ventured into Arlington for a stop at the famous Carolyn's Essenhaus for made-from-scratch home cooking, and of course a slice of one of Carolyn's to-die-for pies. 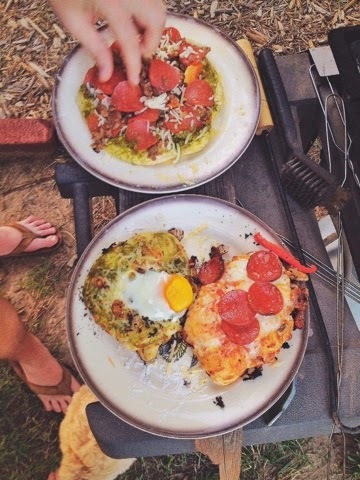 Everyday we helped plan and cook delicious meals, and nothing beats cooking and good company with friends/family.I absolutely loved the night where Meredith and Kyle made pizza dough and we all made our own pizza pies for the grill. 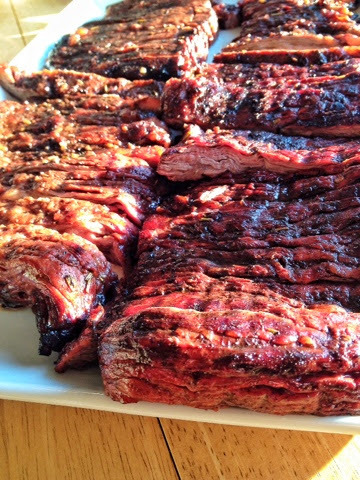 Just a little sprinkle of cornmeal on the bottom of the plate and it slid right onto the grill with ease. 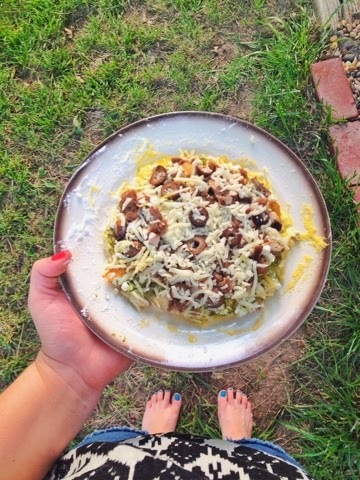 My toppings of choice - pesto, mushrooms, caramelized onions, goat cheese, a sprinkle of parm and a little sausage... oh baby! 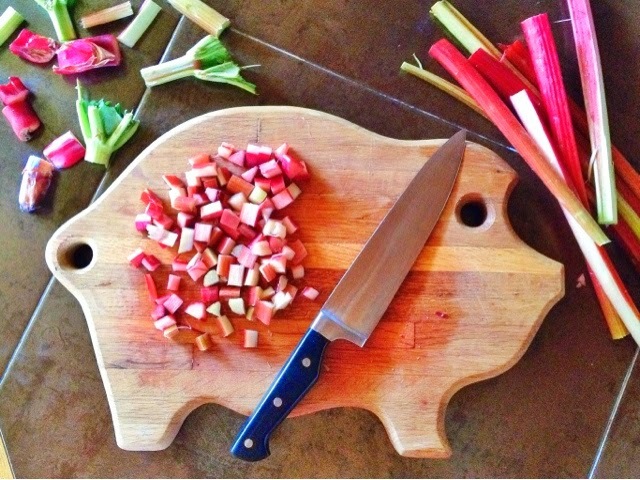 I also checked off "learn how to cook with rhubarb off of my summer bucket list. How on earth did I wait this long to experience this deliciousness? No one can go wrong with a little strawberry rhubarb pie action! How was your Freedom weekend? Hope you all had a wild weekend celebrating with family and friends. We rounded up the fam and headed down to the cabin for a nice long weekend of good food, lots of outdoor activities, and of course, the boys being pyromaniacs (photos coming later today!). I want to give a special shout out to the lovely Mary from Little Bit of Class Little Bit of Sass for becoming a Life of Meg sponsor. Because of wonderful bloggers like Mary, we are ale to help cancer patients by donating 100% of sponsor funds to the American Cancer Society Hope Lodge! Over $350 has been raised in the last few months, and Hope Lodge is doing great things to help patients and families with the donation! Check out more sponsor info below the link-up or click here! From the bottom of my heart, I have to say thank you for faithfully stopping by, spreading the word about Mingle Monday via Twitter and blog posts, and for making blogging such a wonderful blessing for me. Now, let's get mingling!